Here are some thoughts on car parking, based on my experience of living in Weymouth for the last five years. I’m not offering a comprehensive guide to all the car parking options available, nor making recommendations. When considering car parking, my first step is to question whether I need to take my car at all. The centre of Weymouth is around a half hour walk from where I live and, giving that walking is better for both me and the environment, it’s usually my first choice of transport. If I cycled, I’d get down to the Rodwell Trail and ride into town that way. An alternative would be to hop aboard one of the buses that pass near my home, taking me as far as the King’s Statue on the seafront. I appreciate that visitors coming to Weymouth by car can’t make these choices. That said, parking in a quiet residential street some distance from the town centre is an option. But a better choice would be to use the park and ride scheme developed for the 2012 Olympics. It avoids needing to drive into town at all and, being priced on a per vehicle basis inclusive of the bus ride too and from, it’s pretty cheap at £3 (2015 summer price). 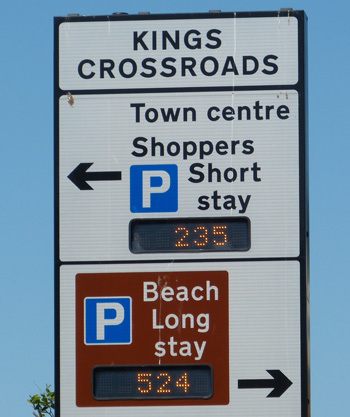 If you prefer the convenience of driving your own car as close to the town centre as possible, then be prepared to queue, particularly at the height of the tourist season. And also be prepared to be confused, because Weymouth’s geography, bisected by the flood plains of the River Wey, can seem a little odd. At least, it did to me in the early days. The most obvious car park, for those following the road signs and not their intuition, is the massive Swannery car park, approached by crossing Westham Bridge and then swinging left before KFC. 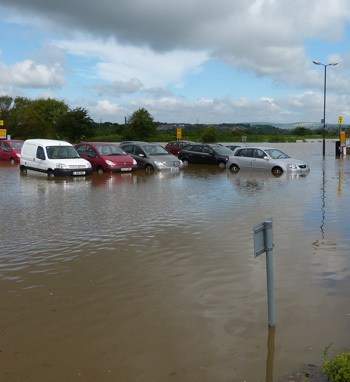 A mild word of warning if you park here during exceptionally wet weather – the car park can flood. If you want to get even closer to town, turn right having crossed Westham Bridge and choose one of the car parks beside the marina. There’s also Weymouth’s only multi-storey along that road which, from my experience, was built when cars were smaller than they are today. I took a Ford Galaxy in there a few years ago and was barely able to get up and down the ramps. Parking in one of the several town car parks will cost you around £8 for a day (2015 prices). When you look at a map, Weymouth seems to have plenty of car parks. What it lacks, however, is a road system capable of handling the traffic that fills those car parks at busy times. If you want to avoid the congestion and queues of the town centre, use the park and ride!